LEXUS has a new performance hero – meet the jaw-droppingly beautiful, V8-powered Lexus LC 500 unveiled at Detroit. 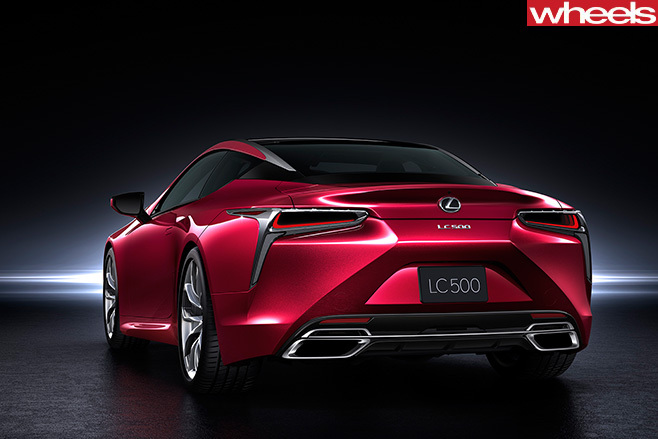 Already confirmed for Australia, the LC 500 marks the debut the company’s new Global Architecture Luxury (GA-L) platform that will underpin all future front-engine, rear-drive models. Boasting the stiffest monocoque chassis ever fitted to a Lexus the LC 500 features carbonfibre door structures and an optional carbonfibre roof. This helps it to surpass even the mighty carbonfibre-infused LFA supercar for structural rigidity. Power comes from the same evil-sounding naturally aspirated 5.0-litre V8 used in the lesser RC-F Coupe and GS-F sedan, where it produces 351kW/530Nm and revs to 7300rpm. A new 10-speed automatic shuffles grunt to the rear wheels, with Lexus claiming the lightning-quick auto can match a dual-clutch unit for shift speeds. All this makes the LC 500 rather rapid; it should hit 0-100km/h in under 4.5sec. But this is not a Porsche 911 fighter – the four-seat LC 500 is much bigger than a Carrera and rides on a 2870mm wheelbase, with a total stretch of 4760mm. Size-wise, the LC rivals the likes of the Mercedes-Benz S-Class Coupe. The LC’s rigid and lightweight chassis, independent suspension at all four corners, and near-perfect weight distribution all promise to make it the best-handling Lexus to date. One possible area of concern is how the LC 500 will ride. Large 21-inch wheels shod with low-profile run-flat tyres don’t exactly promise luxurious levels of ride comfort. No word on when the LC 500 will arrive in Australia or how much it’ll cost – Lexus Australia says it's way too early to talk pricing, even though US models will start from roughly $US100,000 (about the same price a BMW 650i Coupe) – but what we can confirm is that it looks even better in the metal that it does in pictures. 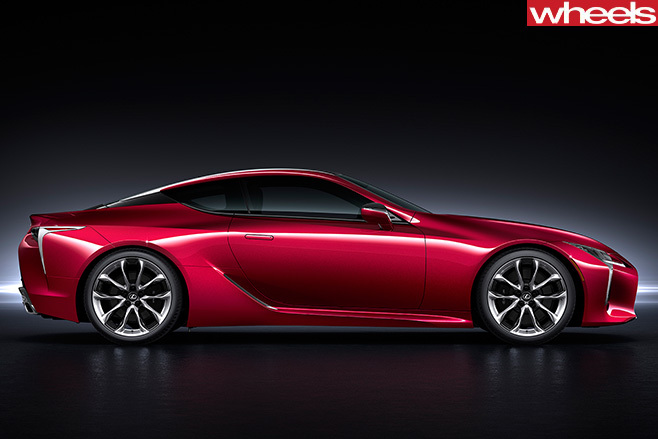 Drawing heavily on the design of the LF-LC concept car unveiled at Detroit in 2012, the LC is an absolute stunner. We should know more details about the coupe's 2017 arrival here later this year, the luxury arm of Toyota says.